C’mon. You knew I was not going to let that one slip by. President Trump, in a meeting with African leaders, twice name-dropped Nambia and in one mention held it up as having a nearly self-sufficient healthcare system. Funny thing to mention as the US is on the brink of eviscerating its healthcare system. But I digress. The point is that when you are speaking to the president of a country, you take a minute to learn how to pronounce the country’s name correctly. Even write it phonetically in the text if you have to. (I’ve done that.) 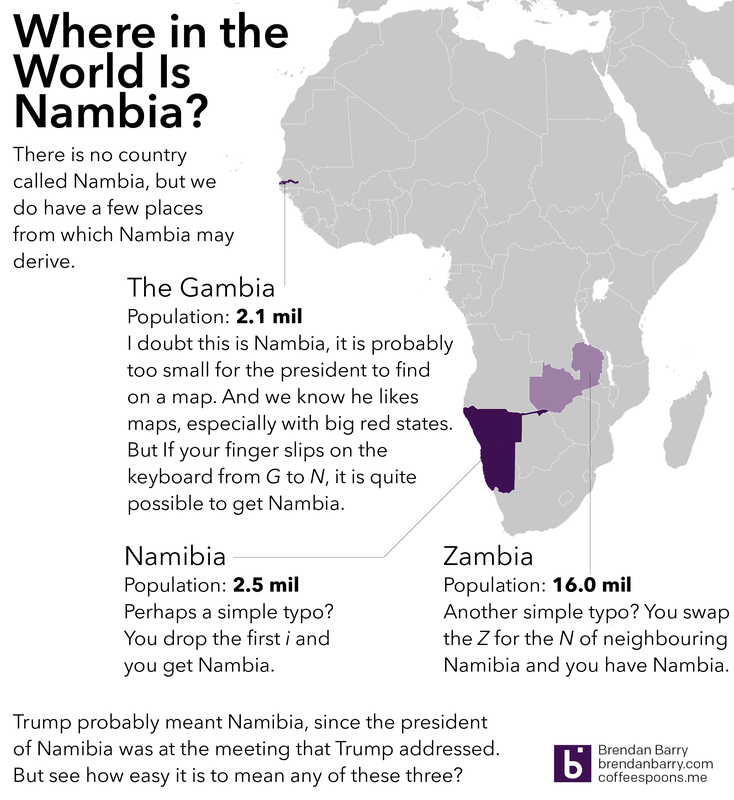 So where is Nambia? One of the stories I am interested to work on visualising in that mythical land of free time is a comparison of potential host cities for Amazon’s recently announced HQ2, a second corporate headquarters. In the meantime, I read this piece from the Times that attempted to decide for them. I have some qualms with it, first that it excludes other North American cities—I would not be surprised to see Toronto win the headquarters. I have doubts that Mexico City would work, but it is possible. But my biggest problems are with the exclusionary nature of the selection. That is, within this set, cities that have x. Of the cities that have x, the cities that have y, and so on and so forth. Personally I suspect Amazon will be looking at which cities not only fit the most requirements, but also which cities will ultimately give them the best business deal. And that I think is a very difficult to describe category. But it is fun to try. Credit for the piece goes to Emily Badger, Quoctrung Bui, and Claire Cain Miller. Lo and behold, this morning I opened the door and we had the shrinking permafrost of Alaska this morning. Now that is basically it. 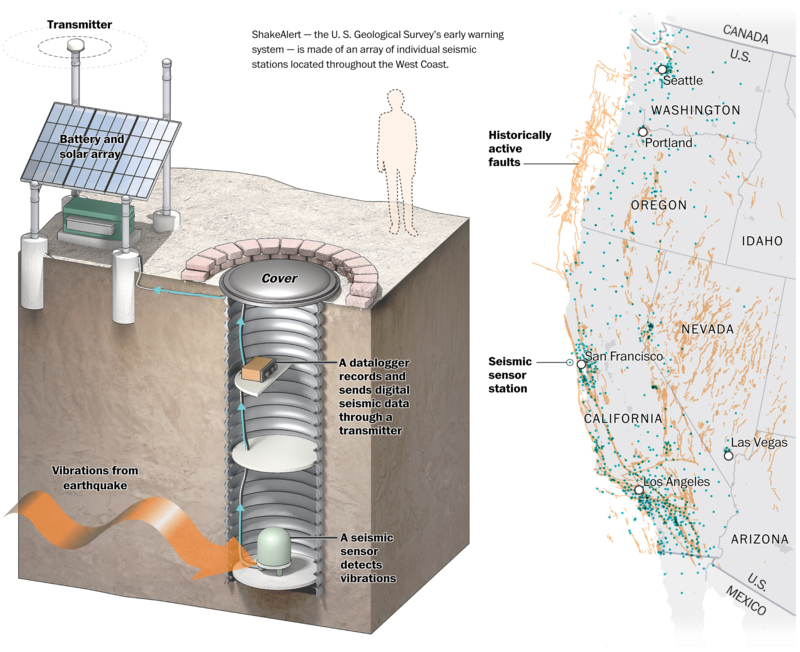 I have a crop of the map at the end here, but the map was the extent of the data visualisation in the article. Indeed, other articles in today’s edition carried more interesting graphics—I took photos to hopefully circle back—but the nerd I am, I really do get a kick finding a paper like this in the morning. 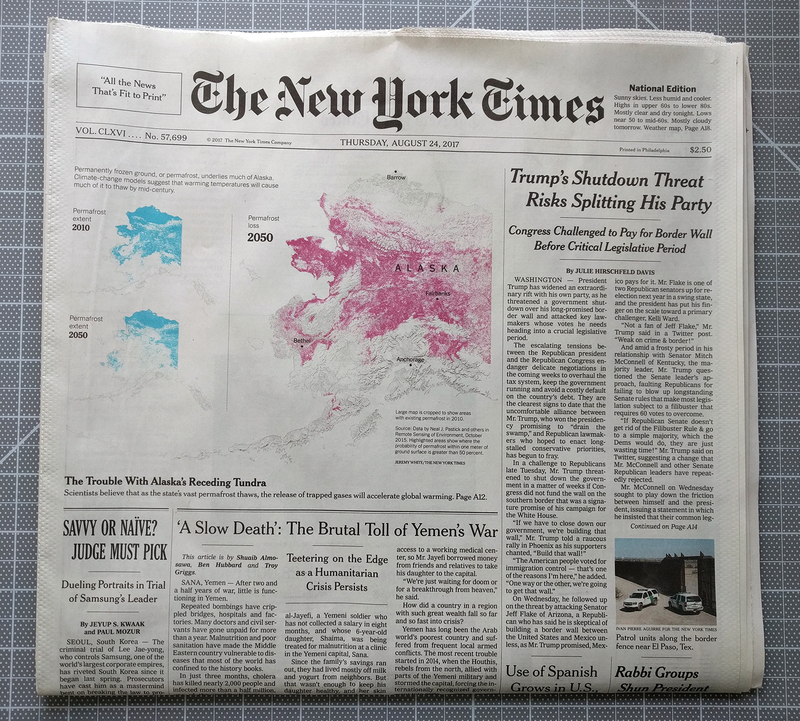 The graphic itself occupies half the space above the fold and the bright cyan and magenta steal the user’s attention. 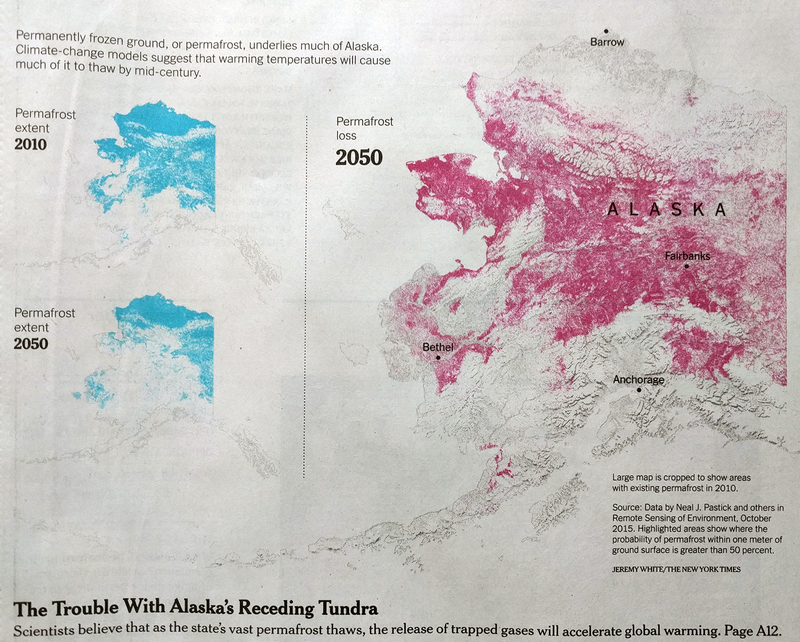 Even the headlines of the other articles recede behind the Alaska maps. White space around the maps subtly helps focus attention on the piece. To be fair, the shape of Alaska with its archipelagos and bays along with the southeast extension help to create that space. A more squarish shape, say Colorado, would not quite have the same effect. If I had to critique anything, I might have placed the city labels, especially Fairbanks, and the state label elsewhere to enhance their legibility. But at that point, I’m really just quibbling around the edges. Credit for the piece goes to Jeremy White. We made it to Friday, everyone. 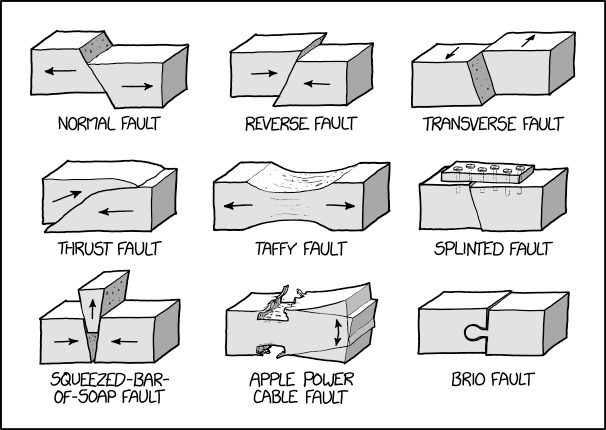 So let us end the week with an examination of the different type of geographic faults, as explained by xkcd. Today’s post is not so much about a graphic per se, instead I read an article in the Guardian about how Boston’s public school system has decided to switch from the Mercator map projection system to the Gall-Peters projection system. The article is worth a read if only for the embedded clip of the episode of the West Wing where they talk about the Gall-Peters. 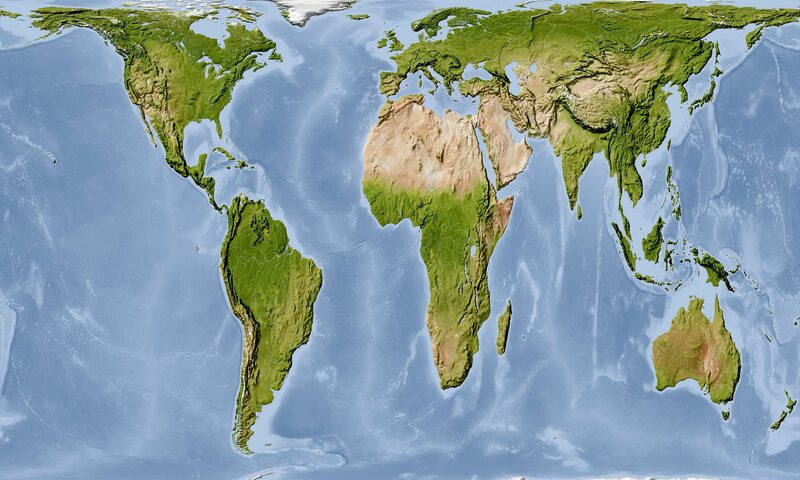 But for those of you not familiar with map projection systems, the problem is it is impossible to perfectly reproduce a three-dimensional spheroid onto a two-dimensional flat plane. Some maps sacrifice proportions for straight lines, others sacrifice shape for area, and so on and so forth. Credit for the map image goes to Alamy Stock Photo via the Guardian. When I was in high school in 2002, it was big news when one of the three Larsen ice shelves in Antarctica, Larsen B, collapsed. And then when I was at university, the band British Sea Power wrote a song titled “Oh Larsen B” that I have always enjoyed. Now Larsen B was not the first Larsen ice shelf to collapse. That dubious honour belongs to Larsen A, which collapsed in 1995. But, Larsen B will not be the last as the third, Larsen C, is now on the verge of collapse. 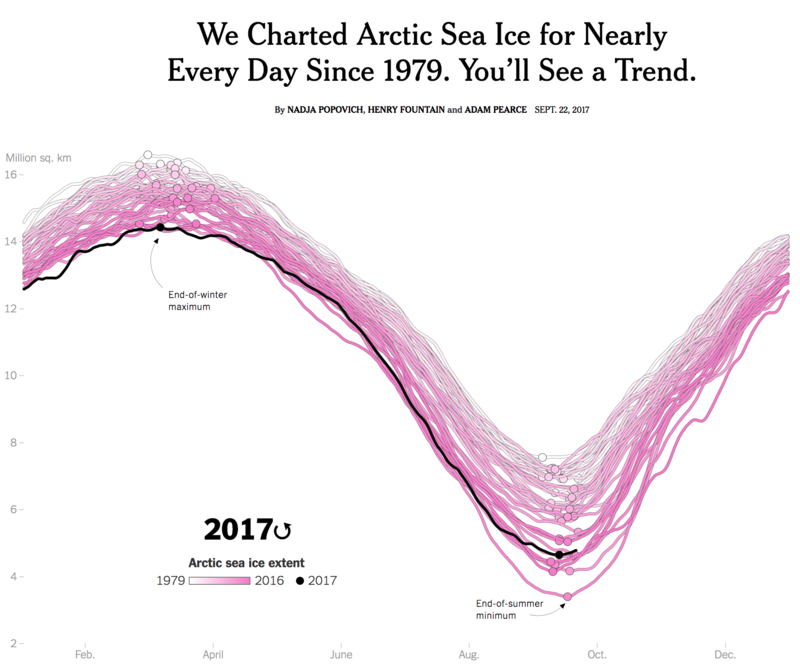 This graphic from Adrian Luckman, reproduced by the BBC, illustrates how the rift calving the shelf has seen accelerated growth recently. I believe the colours could have been designed a bit better to show more of the acceleration. The purple fades too far into the background and the yellow stands out too much. I would be curious if the data existed to create a chart showing the acceleration. The inclusion of the map of Wales works well for showing the scale, especially for British audiences. 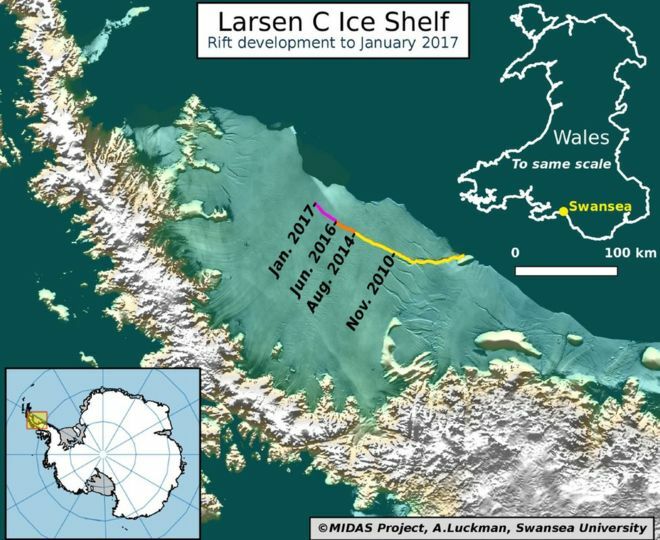 In other words, an iceberg 1/4 the size of Wales will be released into the Southern Ocean. For those not well versed in British geography, that means an iceberg larger than the size of Delaware. That’s a big iceberg. Credit for the piece goes to Adrian Luckman. You clearly didn’t miss this story from two weeks ago, because we all had to change our clocks. But, you might not have thought much about it. Which is fine, because I think there was an election or something a day or two later. Or was I dreaming/nightmaring? Thankfully Andy Woodruff did think about it and he put together a really nice piece about how the changes to time affect the amount of perceived sunlight. I say perceived because obviously the same amount of sunlight falls upon the Earth, but it’s whether we can see it from underneath the covers or hidden behind our office computer monitors. His interactive piece lets you examine scenarios based on your preferred inputs. For example, as someone who goes to work a bit later in the morning—I have to write this blog sometime, right?—I would prefer the sun to be up later into the evening. 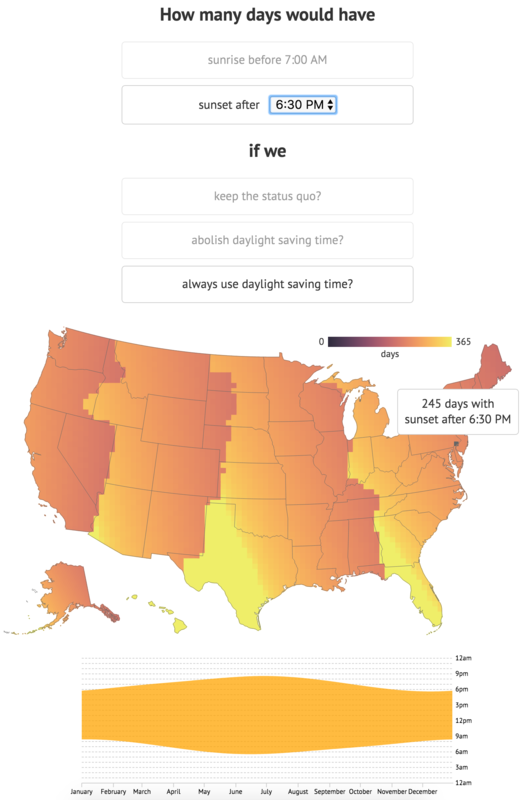 And based on my selections, that means that I should consider the argument for always using Daylight Savings Time. 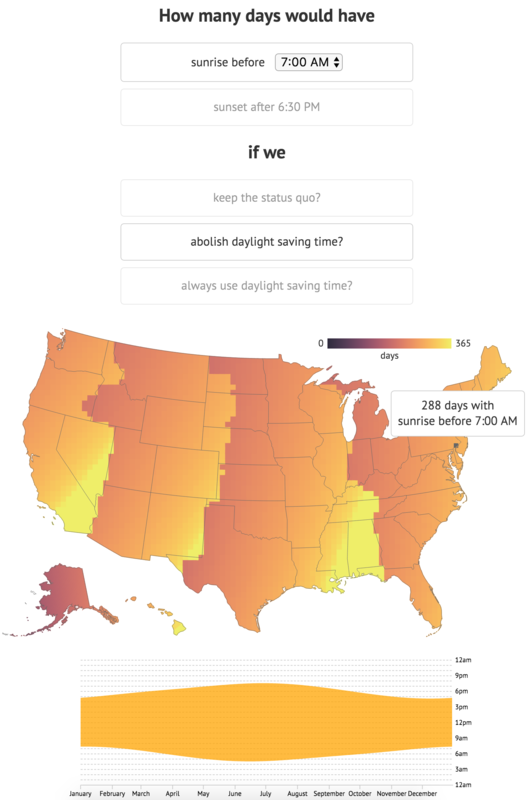 Whereas if I valued a sunrise with daylight, I might prefer to abolish Daylight Savings Time. Credit for the piece goes to Andy Woodruff. Again, the election is next week. And since I have moved from Chicago to Philadelphia, I now find myself in a contested state. This piece comes from the New York Times and explores the polling results across the blue-leaning-but-still-a-swing-state. I find it particularly interesting just how much red and purple there is in the suburban counties of Delaware, Chester, Montgomery, and Bucks all surrounding Philadelphia. But that will only make my vote matter more than it would have had were I still living in Chicago. But you should also check out the piece for some updates on the Senate race we have going on here. The Republican Pat Toomey is running for re-election against the Democrat Katie McGinty. The race can be described as a tossup as the polls seem to be flipping back and forth. But there is some interesting polling data to be found in the article. In about a week we will see just how Pennsylvania goes for both the presidential election and the Senate election. Credit for the piece goes to Nate Cohn.